Finally we get the battle between Batman and Bane. And it's not pretty to say the least. Batman arrives back at Wayne Manor only to find Alfred injured with Bane standing over him. Bane reveals that he knew for quite sometime that Batman and Bruce Wayne were one and the same. Batman ask what has this all been for. The releasing of Arkham inmates and such. Bane tells Batman that this had been his whole plan all along. Not only to test and study the Batman but to weaken him as well. Batman angry at the death and destruction that Bane has brought to his city slips on his mask and attacks Bane. 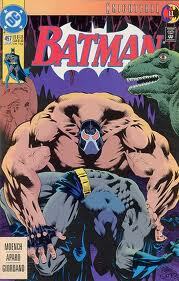 But after fighting so many of his rouges and going toe to toe with Bane's henchmen Batman has nothing left in the tank. Bane beats Batman right down to the Bat Cave. Alfred runs over to where Robin in his guise as Tim Drake lives with his father. Robins father's mansion is right across from Wayne Manor. Alfred tells Robin that Batman is in very deep trouble and they may need to call an ambulance. Back in the Bat Cave Bane drops the giant penny on Batman then slams him head first into the Batmobile. Batman attempts to fight back throwing a punch only to have Bane block it. Bane sends Batman crashing into the glass case that houses the second Robin, Jason Todd costume which causes it to fall over and draped Batman. Bane picks up Batman telling him that he could kill him but that would only silence his same. Lifting him over head Bane slams Batman on to his knee breaking his back.